For every three individuals who have had a stent implanted to keep clogged arteries open and prevent a heart attack, at least one will experience restenosis—the renewed narrowing of the artery due to plaque buildup or scarring—which can lead to additional complications. 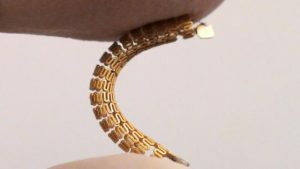 Now, a team led by UBC electrical and computer engineering professor Kenichi Takahata has developed a type of “smart stent” that monitors even subtle changes in the flow of blood through the artery, detecting the narrowing in its earliest stages and making early diagnosis and treatment possible. The device uses medical-grade stainless steel and looks similar to most commercial stents. Researchers say it’s the first angioplasty-ready smart stent—it can be implanted using current medical procedures without modifications. Research collaborator Dr. York Hsiang, a UBC professor of surgery and a vascular surgeon at Vancouver General Hospital, noted that monitoring for restenosis is critical in managing heart disease.The device uses medical-grade stainless steel and looks similar to most commercial stents. Researchers say it’s the first angioplasty-ready smart stent—it can be implanted using current medical procedures without modifications. The research is described in the May issue of Advanced Science and featured on its front cover. Engineering researcher Xing Chen, now a research associate at the Johns Hopkins School of Medicine, and Babak Assadsangabi, a postdoctoral fellow at UBC’s faculty of applied science, also contributed to the study. More on the interventional cardiology market in the U.S. can be found in a series of reports published by iData entitled the U.S. Market Report Suite for Interventional Cardiology Devices. This report covers the following market segments: coronary stent, coronary balloon catheter, balloon-inflation device, interventional coronary catheter, interventional coronary guidewire, coronary embolic protection device, coronary atherectomy device, coronary thrombectomy device, chronic total occlusion system, introducer sheath, coronary vascular closure device, diagnostic coronary catheter and guidewire, intravascular ultrasound (IVUS) and optical coherence tomography (OCT). The iData series on the market for interventional cardiology covers the U.S., Japan, and 15 countries in Europe including Germany, France, the United Kingdom (U.K.), Italy, Spain, Benelux (Belgium, Netherlands and Luxemburg), Scandinavia (Finland, Denmark, Sweden and Norway), Portugal, Austria and Switzerland. Reports provide a comprehensive analysis including units sold, procedure numbers, market value, forecasts, as well as detailed competitive market shares and analysis of major players’ success strategies in each market and segment. To find out more about interventional cardiology device market data or procedure data, register online or email us at [email protected] for an U.S. Market Report Suite for Interventional Cardiology Devices brochure and synopsis.